Could Someone Send This to Chris Hemsworth as a script? I don’t usually visualize characters that specifically when reading, having vague ideas of “attractive man” in my head. This novel, however, proved the exception, since I couldn’t help but see Rupert Carsington as Chris Hemsworth. More specifically, Thor: Ragnarok Chris Hemsworth with a smidge of the huntsman from Winter’s War (because of the smirk). Rupert is another one of Chase’s hellions, never one to shy away from a fight, someone who will help the weak, surprises other characters with the occasional tidbit of knowledge when he usually plays the “dumb hothead” role, gives others nicknames rather than using their names, has a deep voice, is built like a wall, and is generally amused by what is going on around him. When Daphne, the love interest, mentions that she may have cursed out some government officials that had power over their freedom and potentially life, his response is simply, “that is exciting.” In other words, this is the first romance novel I have ever finished and thought, “I need this to be a movie now” because it is the first time where I thought an actor so perfectly fit a romance hero. Daphne suspects that her brother has been kidnapped, but the English consulate in Cairo assumes she is being hysterical and that her scholarly, Egyptologist brother has simply been distracted on a drunken bender or in a brothel. Still, Daphne is a rich widow so the consulate wants to appease her by offering her the services of the one Englishman not currently occupied with real work. Of course, the reason that Rupert isn’t occupied is because he is in prison for fighting Egyptian soldiers. Rupert gets under Daphne’s skin but he is quite drawn to her, and enjoys getting under her skin. The two quickly realize that her brother was kidnapped because other archeologist suspect he might be able to translate a Egyptian scroll leading to a vast treasure. No one knows that Daphne is actually the brilliant scholar, forced to hide her work due to her gender. Though Daphne has other friends in Cairo that agree to help find her brother, she continues working with Rupert because he will actually let her be involved leading to a trip to the pyramids and chase across Egypt to save her brother. 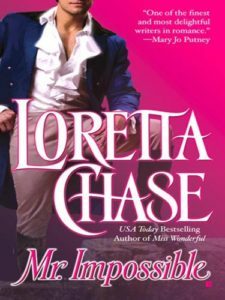 Chase is great at writing brilliant women and men that can appreciate them, and are perfectly happy being the brawn to their brains while still being more insightful than many realize and allowing the heroines new freedoms. I had so much fun reading this one, both due to the minor flashbacks to The Mummy and Rick and Evie, and the fact that I could absolutely see this one as a movie. I quite enjoyed Daphne and Rupert, and their chemistry. The reasons the characters were hesitant to get involved were even believable and logical. I think Chase’s sense of humor really works for me, and I’ll definitely continue reading my way through her back catalogue. Share the post "Could Someone Send This to Chris Hemsworth as a script?" I’m so glad you liked this one, and Chris Hemsworth is indeed a very good mental casting choice for Rupert. It may in fact make me love the book more than I already do. Thank you so much for the recommendation! Now that you’ve mentioned Chris Hemsworth, I think I have to read this one. Thank you! It’s just so much fun! Hope you enjoy it! If they made this movie with Chris Hemsworth it would be the best thing to ever happen. They almost NEVER make romance movies and when they do they pick terrible books (ugh50shades – le tragique). “Movies for women” is still considered low-budget niche and I’m hopeful that the massive success of women-centric movies creates more opportunities for great romance novels to be made into movies. There’s enough adventure going on in this one that I feel like it would be an easier sell but I’m sure between The Mummy and that Matthew McConaughey desert movie, Hollywood would say no. Two things: 1. Mr. Impossible has been on my TBR for at least two years. 2. Last night I was feeling down (because the world is ending) and I put on Thor Ragnorak. I must read this now. You should! I wasn’t consciously trying to cast this one, but the more I read, the more it felt like Hemsworth! Is this the one where the consummate their relationship during a sandstorm? In a cave during a sandstorm, yes!